Inspired by A Dream Deferred, a poem by Langston Hughes, a poet writing at the time of the North- American Harlem Renaissance movement in the 1920’s, Tracey Rose’s series of sculptures titled A Dream Deferred (Mandela Balls) (2013- ongoing) is constructed as a commentary on the slow disintegration of ideals upheld in the construction of a new South Africa. In his poem, Hughes asks if a dream deferred dries up like a raisin in the sun. 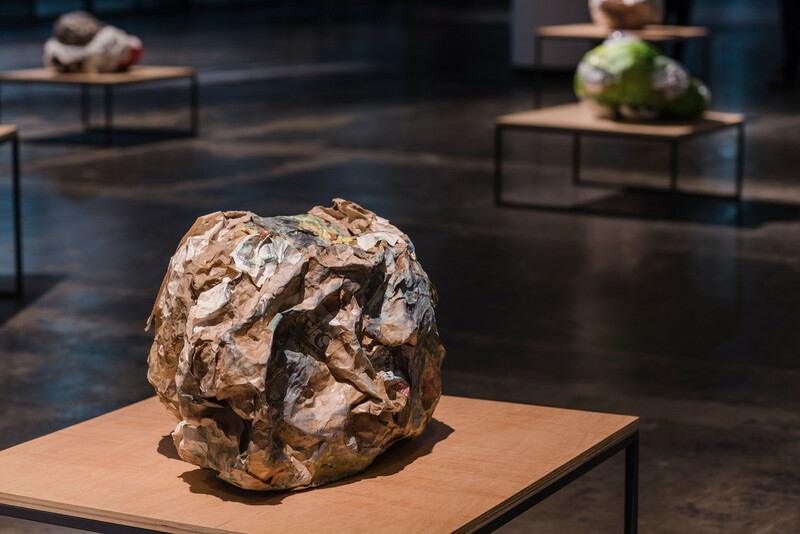 The image of a dried raisin is interpreted by Rose, who constructs the balls using unconventional materials: butcher’s paper, packaging tape, cling wrap, newspapers, paper towels, glue, etc. The balls carry with them accumulations of a lifetime and provoke uncertainties lugged by a nation still under construction. The work makes reference to Mandela’s testicles: his real and mythologized legacy. It also alludes to the act of castration or crushing of African males’ testicles during the colonial period. The work is still ongoing and will result in a total of 95 editions, a reference to Mandela’s age at the time of his death.